We spent the first week of our California trip in Santa Monica, LA’s famous beach-side city. As places to stay in LA. 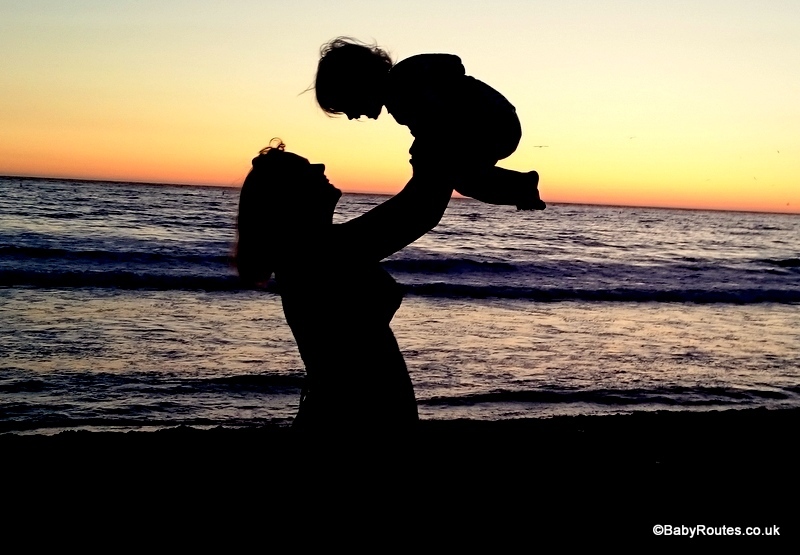 go Santa Monica is pretty family friendly and has a lot going on. 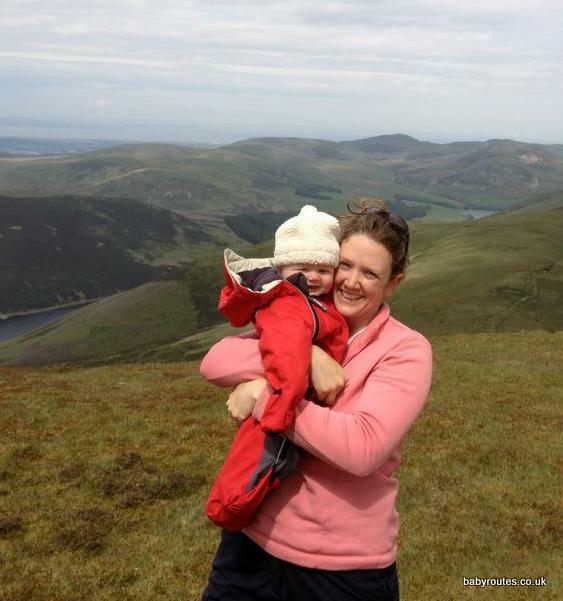 It was a perfect place to take life easy and adjust to the US and jet lag with a 4 and 1 year old. The back-streets are mainly leafy and pleasant to wander, the people are friendly, there’s an eclectic selection of cafes (and boutiques) along Main Street to check out for lunch and then there’s the pier and the beach… oh that endless expanse of sand is a child’s dream! Santa Monica is also really easy to get about. If you are staying within a few blocks of the beach then this is one of the few places in L.A. where you won’t get too many odd looks for choosing to walk there. In fact it’s a great way of drinking in the atmosphere and getting a feel for local life. The bus network is clean, efficient and cheap and there are some great bike routes to take a trailer on (with a Boris Bike style system planned to open up across the city in 2016) so you really don’t need to hire a car here unless you really want to. Oh and later in 2016 the train-line is scheduled to open up in central Santa Monica connecting it to Downtown LA; something I can see boosting Santa Monica’s popularity with visitors even more. Although we only had the chance to try out a week’s worth of family fun in Santa Monica, we took our task very seriously! 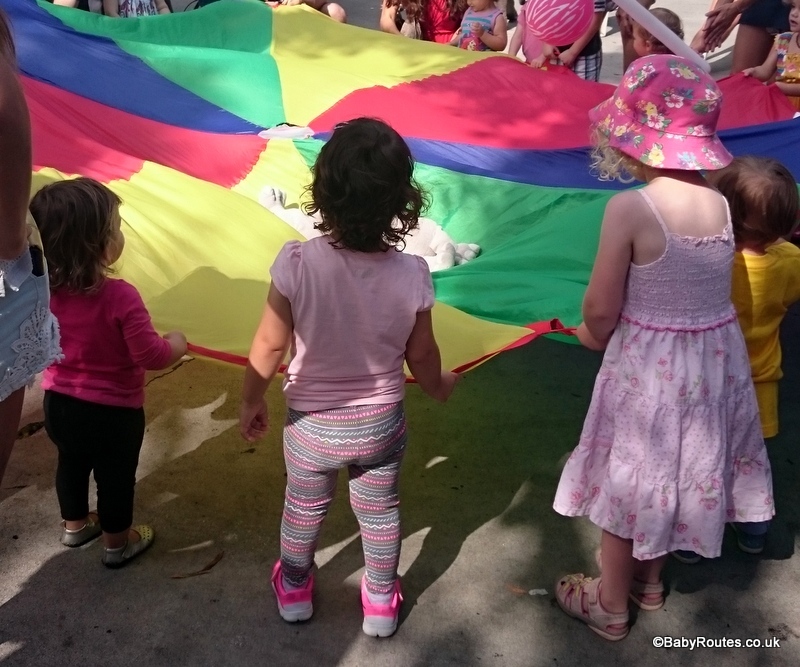 Here are some of our favourite things to do with young children in and near Santa Monica. The aquarium at Santa Monica pier is only small but that is precisely what makes it perfect for young kids. There’s just enough to keep them fascinated for an hour which makes it a perfect beach retreat from the heat of the early afternoon sun. 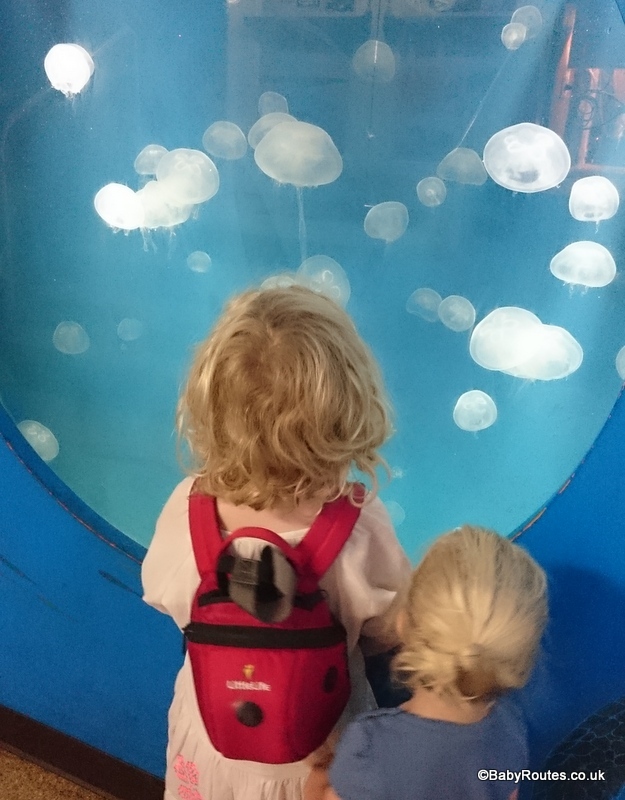 Visit on Kids will particularly love the touch tanks where you can get your hands wet and feel all sorts of creatures that live in the local rock pools – everything from starfish and hermit crabs to sea urchins and anemones. You’ll come away with a renewed appreciation of the battle going on to keep the seas here clean and full of life. Santa Monica Aquarium is the public education face of the Heal the Bay group who work tirelessly to conserve local marine life. Open Tuesday-Friday 2-5pm; Saturdays & Sundays 12.30 – 5pm. 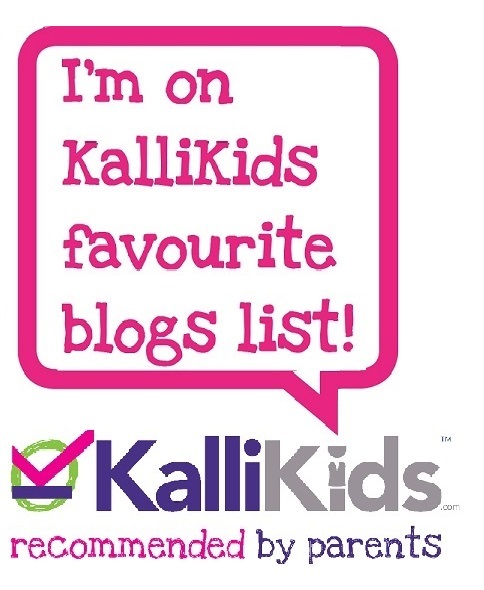 Worth checking the website for details of special programs e.g. get there from 2.30pm on Tuesdays and Fridays to help feed the starfish, 1pm on Satuday for a local bird tour; 2pm on a Saturday for storytime or 3.30pm on Sundays to see the sharks being fed. N.b. The aquarium is located below the start of the pier at beach level. The bright lights of Pacific Park. 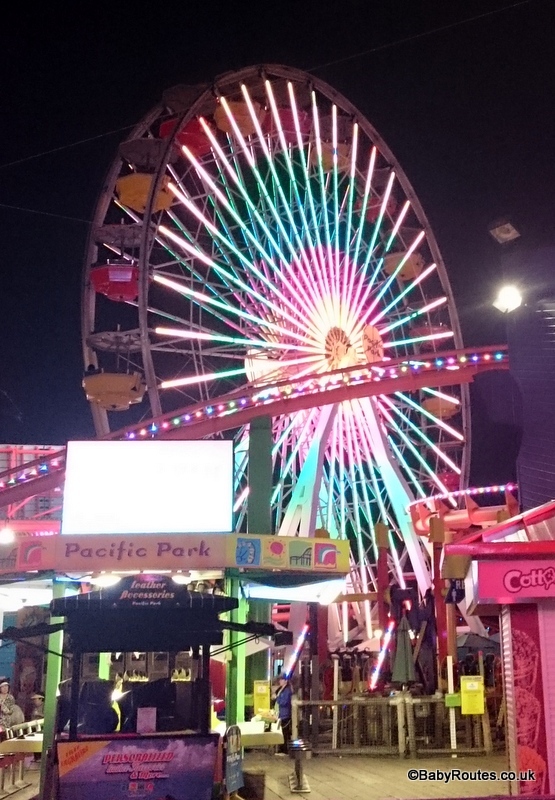 The big wheel located in the Pacific Park on Santa Monica Pier is Santa Monica’s most famous landmark. It doesn’t cost anything to get into the park (you pay per ride) and once inside there are different rides and stalls to choose from based on height and age group. We took Roo and Beth up on the big wheel at sunset and enjoyed brilliant views over the ocean and city. Get there well before sunset though – the queue to get on can take a good 15 minutes. Check the park hours before you go – they vary by season, although generally operate between 12pm and 7pm as a basic standard. If you’re looking for something a little bit different for family supper then grab a blanket and head down to the Santa Monica food trucks. 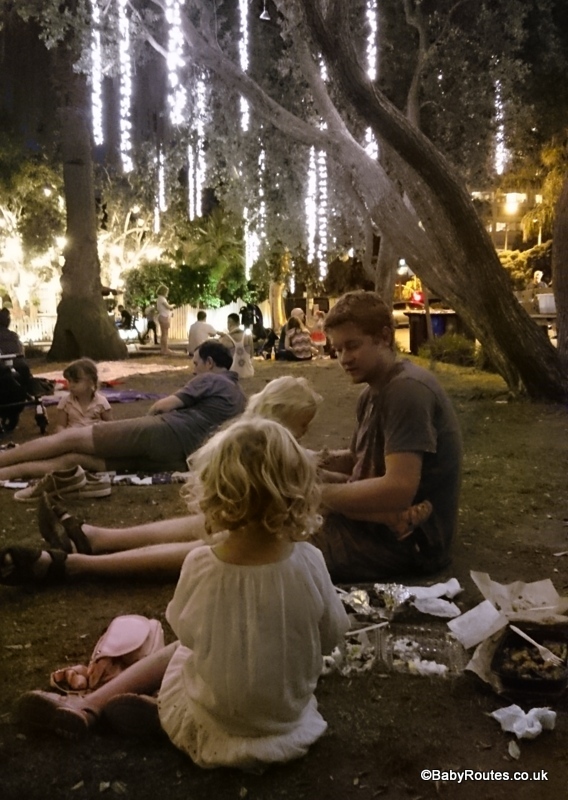 Choose your supper from a weekly changing selection of cuisines sold from mobile restaurant vans in the parking lot on Main Street, grab some drinks from the bar stall and then retreat with your provisions to the grassy lawn for a picnic blanket supper lit up by pretty fairy lights in the trees. It’s a great place to meet local families and the kids can run about with their new friends whilst you finish your food in peace. If you need a table then the Victorian bar next to the food trucks lot lets you bring in your food. This is the thing that Roo asked to go back and do again most after we left Santa Monica. Opening hours are 5-9pm every Tuesday. The food trucks lot is located just off Main Street, between Ocean Park Blvd & Hill Street (next to the California Heritage Museum). Park round the corner in the main car park off Hill Street just round the corner. Parking at the food trucks lot itself is expensive! Roo joining in with dancing and singing at the Santa Monica farmers market. The Main Street market is held every Sunday between 9am and 1pm. There are also large organic farmers markets held in Downtown on Wednesday and Saturday mornings – favaourites with local chefs and a great place to head for brunch. For more details on all of Santa Monica’s farmers markets, check here. The girls in their trailer exploring Playa Vista beach. Santa Monica’s beach front is golden, wide and endless. You don’t need to be told that it’s a good place to go with kids – it’s probably the reason why you’re in Santa Monica in the first place! If you want to explore as much of the glorious Pacific view as possible though then consider hiring some bikes and kiddy trailers. You can even hire electric bikes if you want an easier ride! The Marvin Braude Bike Trail runs 22miles from Will Rogers State Beach in Pacific Palisades to just south of Redondo Beach. Head north from Santa Monica Pier for a shorter ride along some wilder beach or head south to explore Venice Beach and beyond. You are only limited by how far you can pedal! 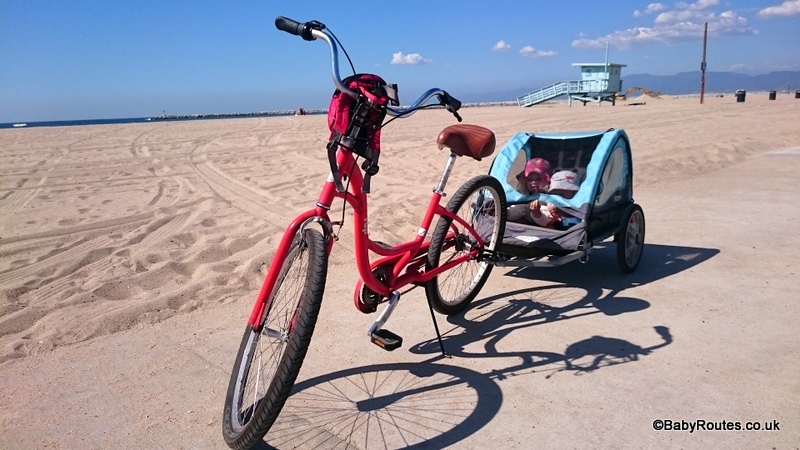 You can hire bikes right next to Santa Monica Pier at Sea Mist Rentals. There are loads of other bike hire companies around Santa Monica though so it pays to shop about. 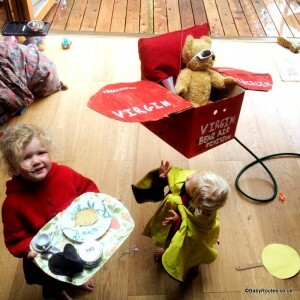 At peak times call ahead to book a kids’ trailer. Nearby Venice Beach is a favourite with kids purely for all the quirky stuff that is going on there. Roo is still talking about the skateboarding dog she saw and begged with me to buy a Tuffla Tree (think Lorax – Dr. Seuss) from a stall there and we went on a quiet day! 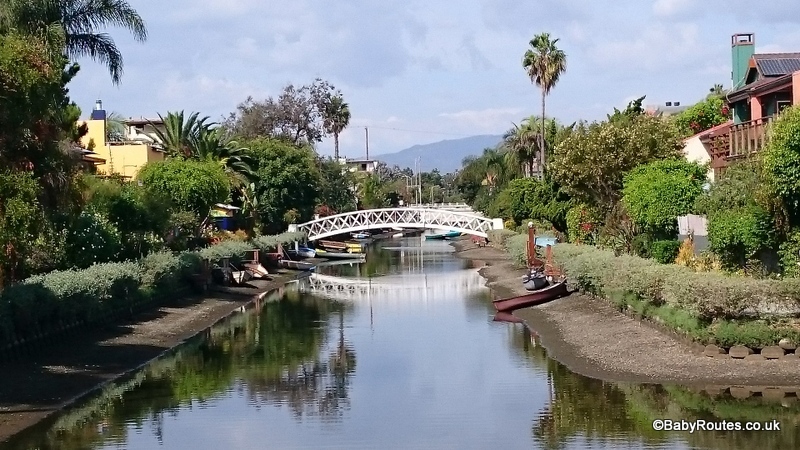 Stroll along the Venice Boardwalk to check out the stalls and street performers, peer in at the body builders working out at outdoor gym Muscle Beach then loop round and up through the pretty and peaceful Venice Canals for a complete change of scene. Just keep your visit during daylight hours – the Venice Beach district has a bit of a reputation after dark. 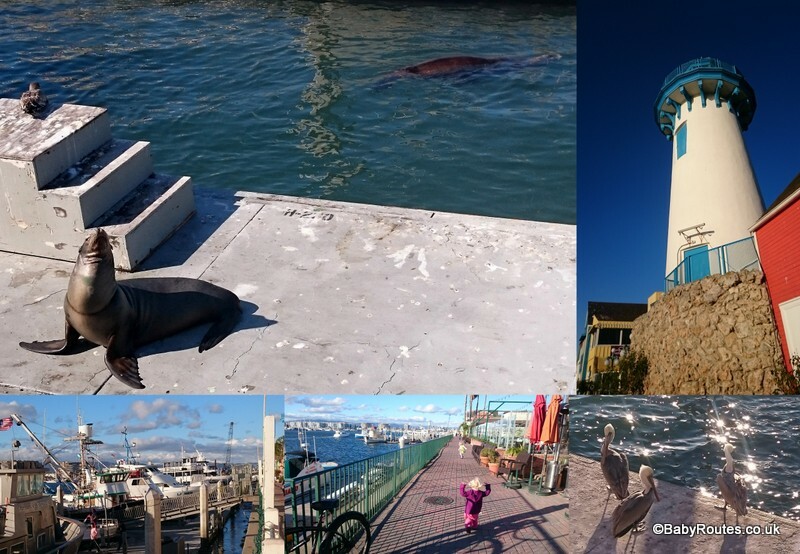 Sea lions, boats and pelicans – Marina del Rey is a child’s delight. We loved Marina del Rey. Just under 20 minutes drive away (or you can catch the bus) Marina del Rey is the world’s largest small vessel marina. With boats lined up in every direction as far as the eye can see and plenty of boat-proud people at work on their beloved vessels, this is a perfect place to take kids for a chilled out morning or stroll with a pushchair. Fisherman’s Village is a good place to base yourself. From here you can wander the harbour front looking out for cheeky pelicans and sea lions who can be frequently found trying to pinch the local fishermen’s catch, hire a bike & trailer from Daniel’s Bike Hire (we used them) and explore down to Playa Vista, take a boat trip, explore the park at Burton Chace, grab an ice-cream or just treat yourselves to the fantastic milkshakes at Thai Garden Cafe; just learn from my mistake – one milkshake minus the cream is more than enough for two preschoolers to share! Nothing beats those spectacular Pacific sunsets. 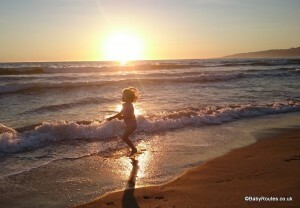 You have to keep the kids up late at least once and go for a sunset paddle next to Santa Monica Pier. Watching the huge orange ball of sun dip below the horizon followed by the lights leaping into acion on the pier is a must. A bit of supervised paddling aside, the ocean at Santa Monica is not always ideal for swimming with very small children. The sand shelves fairly quickly and the waves can be pretty strong. You also need to be careful not to swim there for a few days after it rains due to pollution from the city run-off. Don’t worry – there are plenty of other beach options nearby but if you prefer to stay in Santa Monica then you can also make use of the swimming pools too. The Annenberg Community Beach House is a public beach club with pool, beach access and classes (they even do some kid yoga)! The pool is only open during the summer months though. Alternatively you can head to the Santa Monica Swim Centre to make use of their outdoor pools. Check their website for opening hours. Breakfast on the beach at Perry’s. Please note lack of children in the photo. They were busy playing in the sand. 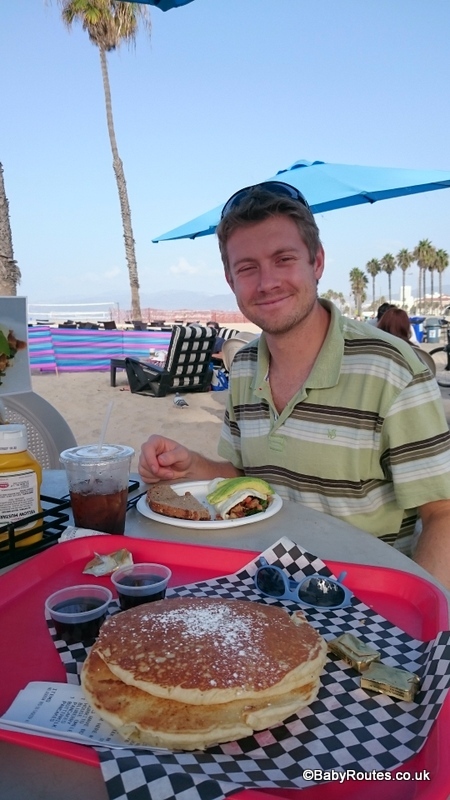 Nothing starts you day better than breakfast with warm sand between your toes and Californian’s know how to brunch! 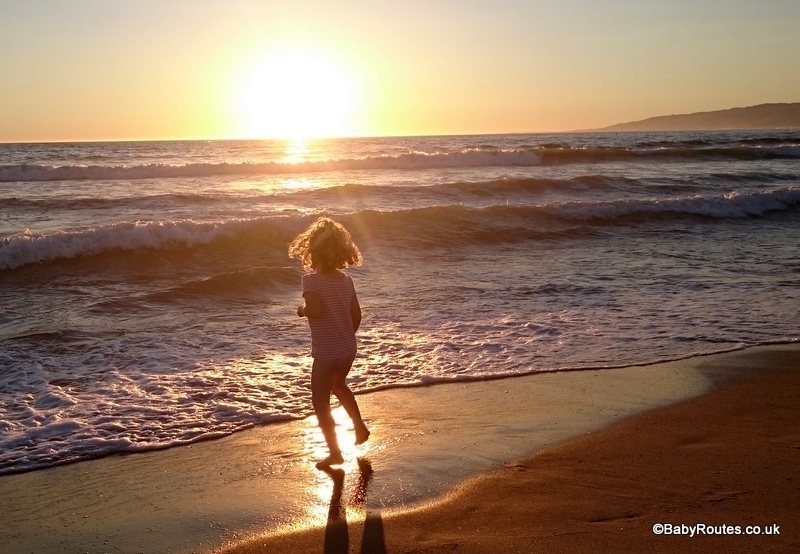 Take your own picnic or head down to one of the Perry’s chain of beach cafes along Santa Monica’s coastline where you can enjoy the papers and coffee with sand on your bare feet whilst the kids run wild on the beach. I can recommend the breakfast burrito and their pancakes are big enough for two tiny tots to share easily. 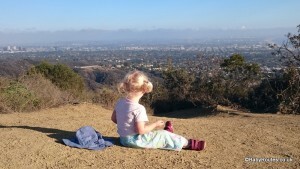 Roo admiring the view from Tongva Park. Yes, park, not pub. Though you can definitely take in a coffee or ice-cream at each stop too! There are children’s play parks spaced out along the Santa Monica beach-front at regular intervals all the way down to Venice Beach. 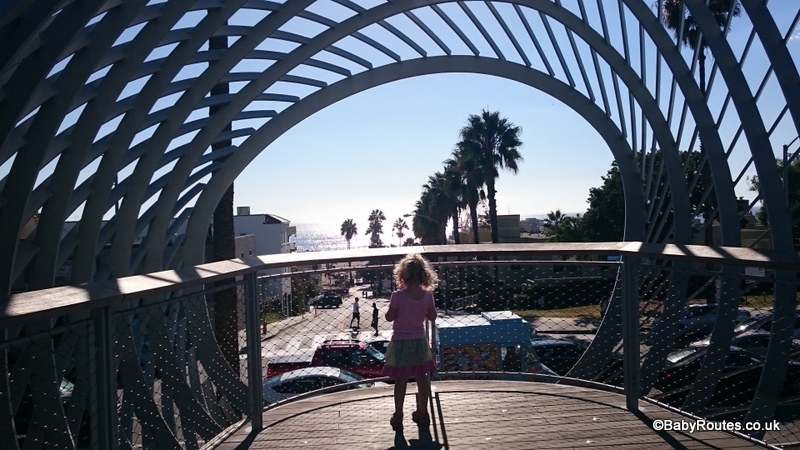 Tongva Park a few blocks back from the pier is also worth a visit if the kids need to run off steam in the centre of town. There’s a nice playground there (mainly suitable for non-toddlers), lots of little paths to explore and tiny tots will love the water cascades and peeping out at the beach from the metal lookouts that overhang the road. All the parks we visited were clean, well equipped and full of all sorts of fun stuff that we don’t see in the quite the same way back in the UK. We particularly enjoyed South Beach park which has lots of fun for very young children as well as their slightly older siblings. Roo was baffled by the swings with overhead harnesses and the slides that had rollers instead of plastic but that all added to the fun. It’s right on the beach and bike path so your next entertainment stop isn’t far away! Santa Monica by Bus (no, you don’t always need a car in LA)! This looks perfect! 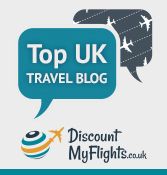 We are off to California next year so some fantastic tips. I’ve heard good things about Santa Monia and now I know why… Breakfast on the beach – how I could do with some of that now! I am a sucker for sunsets too so I’d be going to the beach most evenings! Love the sound of the food trucks and who doesn’t love a skateboarding dog!